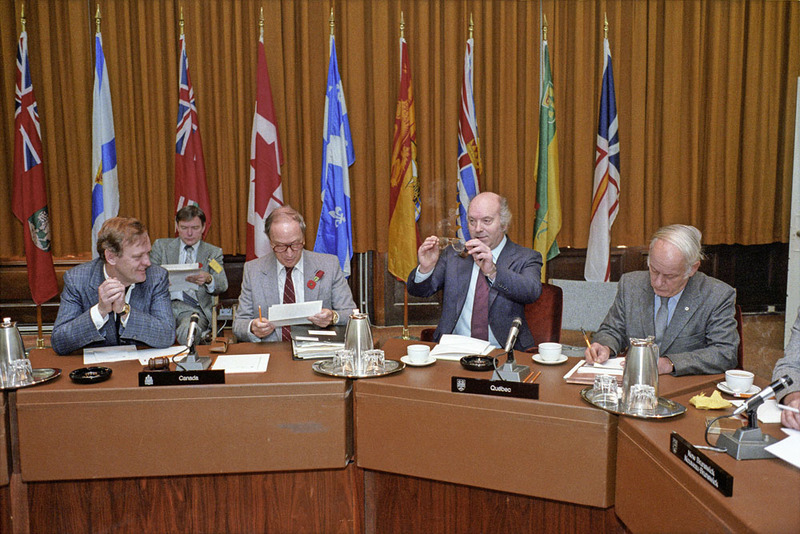 Federal-Provincial Conference of First Ministers on the Constitution, November 1981 – Jean Chrétien; Prime Minister Pierre Trudeau; Claude Morin; and Premier of Québec René Lévesque. Source: Library and Archives Canada, MIKAN 4002122. In the 1960s, Quebec intellectuals debated issues concerning the development of the province and emerging nationalist sentiments. René Lévesque and Pierre Elliot Trudeau emerged as leading intellectual and political figures in these debates. They each wrote about their ideas about political and economic development for the province and reflected on the idea of nationalism among Quebecois. By the mid-1960s, much had changed in the province in terms of economic self-determination, deliverance from the power of the Catholic Church, and an assertion of provincial rights. Historians and other scholars came to describe this as the so-called “Quiet Revolution.” But simultaneously, the province experienced the rise of an extremist, extra-legal nationalist movement. The province was gripped by terrorist acts throughout the 1960s, mainly in the form of bombings. This included hundreds of small-device explosions and a spectacular attack on the Montreal Stock Exchange. The two documents in this module were published in Cité libre, a magazine created in 1950 by a group of diverse Quebec intellectuals who were united in their opposition to the authoritarian government of Maurice Duplessis. By the mid-1960s, however, this group had fractured, especially over the issue of nationalism and separatism. You will read two articles from this magazine and explore competing ideas of nationalism and liberty in Quebec. Lévesque, René. <<Pas plus bêtes que les Arabes>> Cité libre, 11, no. 27 (May 1960): 17-18. Trudeau, Pierre. <<Les séparatistes: des contre-révolutionnaires>> Cité libre, 15, no. 67 (May 1964): 2-6.